On the North wall of the nave at All Saints’ Bolton Percy is a 240cm x 150cm marble memorial dedicated to Elizabeth Hawke (d 19th September 1742). This memorial (see photo below) made by the notable sculptor Richard Fisher and erected in 1748 was commissioned by her only son Sir Edward Hawke. Elizabeth was born at Steeton in 1677 to parents Nathaniel Bladen and Isabella Fairfax and in later life lived at Scarthingwell Hall. She regularly worshipped at both All Saints’ Bolton Percy and St John the Baptist Kirkby Wharfe. The inscription includes the words “In memory of the best of Mothers this monument was erected by her only son Sir Edward Hawke Knight of the most Honourable order of the Bath and Vice Admiral of the BLUE SQUADRON of His Majestie’s Fleet”. As a sailor Hawke had few equals and there are countless books written about him, his naval exploits and conquests. 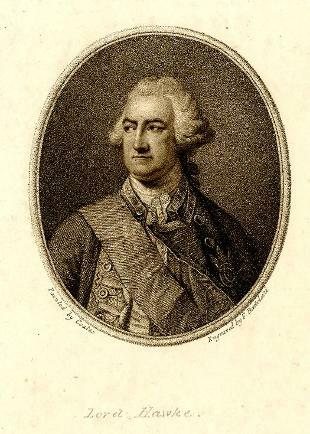 On 16th January 1768 King George III appointed Hawke First Admiral of the Fleet. Hawke was also an elected Member of Parliament for Portsmouth from 1747 to 1776 and thereafter granted the title 1st Baron Hawke of Towton. He died in 1781. There are two other 'Fisher' memorials at All Saints and both can be found in the Chancel. The monument to Lady Milner (Diana Sturt) who died in 1805 was made at the Fisher workshops by John Bacon Jr in 1807 and is much more ornate and bulkier than the one made by John Fisher in dedication of her husband Sir William Mordaunt Milner (died 1811) which is on the opposite wall.